› Adjacent, apparently normally pigmented skin should always be included to compare pig-mented and non-pigmented skin. › It is important to indicate to the pathologist whether the lesion is stable or progressive. 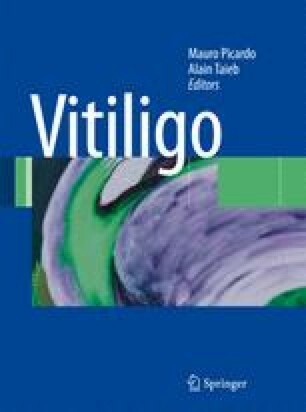 › The main histological finding in vitiligo is a marked reduction or absence of pigmentation along the basal layer of the epidermis. › Absence or loss of melanocytes in vitiligo leads to an absence of melanin resulting in depigmen-tation. Histochemistry (Fontana-Masson stain) and immunohistochemistry help to demonstrate pigment and cell loss. › Associated inflammatory changes and/or pigmentary incontinence may or may not be present, in variable intensity, generally mild, and are noted at an early stage at the border of progressing lesions. › Histopathology is needed to rule out other causes of acquired hypopigmentation, especially mycosis fungoides and leprosy.